TRICERATOPS BRAIN SCAN: This weekend we visited St. Louis, MO where a fossil Triceratops braincase from the Dickinson collection was CT scanned at the radiology facility. X-rays of the CT scan penetrate through the bone of the braincase, creating a 3D model of the Triceratops brain which we will 3D print and put on display in Badlands Dinosaur Museum. The scan is part of a project led by Washington University St. Louis professor, Dr. Ashley Morhardt. She is researching the size and development of different parts of the dinosaur brain, investigating what this can tell us about evolution and ecology. 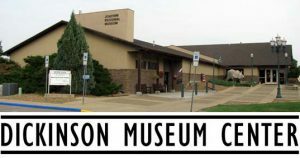 The Dickinson Museum Center is located on a 12 acre campus in Dickinson, North Dakota. Conveniently located just off Interstate 94 the Center consists of four complimentary components: the Badlands Dinosaur Museum, the Joachim Regional Museum, Prairie Outpost Park and Pioneer Machinery Hall.